There's no question who the most popular member of the GIJoe is - it's always been the Joes' Boba Fett, the mysterious commando known only as Snake-Eyes. He was part of the original comicbook pitch that would eventually become the groundwork for GIJoe, and was one of the first 16 figures released in 1982. That figure was pretty generic, representing a fairly standard commando. It wasn't until three years later that we got the figure a lot of folks consider to be the best GIJoe ever: black suit, visior, sword, gun and wolf. That's the Snake-Eyes we all remember. There have been more versions of Snake-Eyes than any other character in the Joe world, but it's taken two decades to make a figure that's better than the second one ever. Some people say that ninjas own the night. If that's the case, Snake-Eyes owns the whole twenty-four hours. Anybody who isn't a mouth-breather has a reasonable chance of sneaking up behind a sentry in the dark. Snake-Eyes can do it at high noon on a gravel path with no cover. A qualified expert with all NATO and former Warsaw Pact small arms, he is proficient in twelve martial arts systems and a master of the same ninja clan (Arashikage) that produced Storm Shadow. His one known hobby is collecting spike-handled trench knives. At one time Snake-Eyes and the Cobra ninja Storm Shadow were sword brothers, but circumstances forced them apart and led Storm Shadow down the evil road to Cobra. Although others see them as bitter foes, Snake-Eyes looks at the Cobra ninja and sees only the best friend he ever had, so he dreads the day he may have to draw his sword against him in earnest. Snake-Eyes has had some goofy costumes over the years (remember his powder blue snow suit? ), but this is a return to the classic grey outfit. Snake-Eyes is totally strapped, with all sorts of weapons sculpted on: he's got a dagger on his chest, throwing stars on his shoulder blades, grenades on his belt, a pistol on his thigh and a sheath on his left boot. The sheath is empty, because the set doesn't include anything to fit in there. More on that later. Even the accessories are authentic - the old Snake-Eyes had a sword and an uzi, and the new one duplicates that. Of course, his sword is a different style now, and he doesn't have a backpack to attach it to, but Hasbro gets credit for the attempt. The figure also includes removable web gear and a second machine gun, and one of those wrid black wrist things that Dr. Link Talbot had. All that would be enough, but for this figure, Hasbro really went all out. 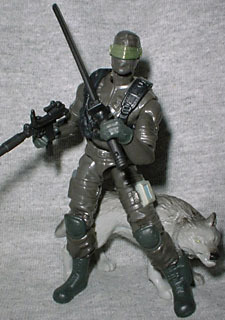 Snake-Eyes' final accessory is something that fans have always identified with him, but was only ever produced once: his wolf, Timber. Snake-Eyes wasn't the first Joe figure to come with a "pet," but he was part of one long-running trend. This new Timber is much better than his (her?) ancestor, both in terms of sculpt and paint. This is one cool wolf. Snake-Eyes moves at the usual 12 points as all GIJoes, but has additional points at the wrists for more poseability. His paint apps are perfect, with the tiny details captured well - the only thing that would make it better is if it was black with dark grey highlights like the original, rather than two-tone grey. This is nice work, all around, and a figure that no GIJoe fan would hesitate to buy, were he single-carded. But Hasbro's business plan calls for two-packs, so Snake-Eyes comes with an enemy to fight, the mutated Cobra Swamp Rat. Swamp Rat infiltrators are Cobra volunteers or captured civilians who have been genetically altered with the Venom serum. Having all the attributes of their marsh rodent namesakes, Swamp Rat forces can slither undetected under the surface of fetid stagnant water for long periods, and compress their bodies to fit inside narrow drainpipes and sewers. Their night-vision, hearing, and sense of smell are extremely acute, and they can subsist indefinitely on foodstuffs that would make a vulture sick. Not especially good as frontline combat troops, Swamp Rat troops are more effective as infiltrators, behind-the-scenes saboteurs and spies. They have a natural ability to sneak up behind people and are very good at escaping and hiding when they are detected. When cornered, they will put up a frenzied resistance and attack even after surrendering. Absolutely any figure packaged with this Snake-Eyes would have found its way into fans' collections, so we're lucky that the Swamp Rat is halfway decent. The figure's design is pretty good. With all his gear on, he really does resemble a rat: he's got pointed little "ears" on his removable helmet and a segmented metallic tail emerging from the gray cloak draped over his shoulders. The uniform underneath is green and black, which might not seem perfect for a guy who's supposed to go unnoticed, but it works with the "swamp" theme. The Swamp rat comes with an impressive kitbashed rifle and two black knives. The knives, also included with the previous two versions of the character, fit in sheaths on the Swamp rat's legs. However, in this set, one of the knives is rubberbanded into Snake-Eyes' hand, leading many to believe it's his accessory, intended for the space on his boot. The truth is clear, however, since the knives are too big to fit Snake-Eyes' sheath. The real selling point of this set is obvious - it's Snake-Eyes and his wolf. While the Swamp Rat could have been relegated to obscurity, he does make a nice enough combatant for the ninja commando to face. Which Snake-Eyes is your favorite? Tell us on our message board, The Loafing Lounge.